We are an active beekeepers association covering Bishop’s Stortford and outlying villages. On this website you will find information on beekeeping and honeybees. If you think you have a swarm, please check out the article on swarms here and if you recognise what you see then please contact one of our swarm collectors, who will hopefully be able to help you. If you have a swarm on your property, contact one of our local Swarm Collectors who will come and retrieve it for you. If you are not sure if you have a swarm, please see our articles About Swarms and Know Your Bees. If possible it is best to leave bumble bees where they are. Honey bees should be collected by a swarm collector. If you are outside the locality then please see the British BeeKeeping Association (BBKA) website to find a swarm collector local to you. 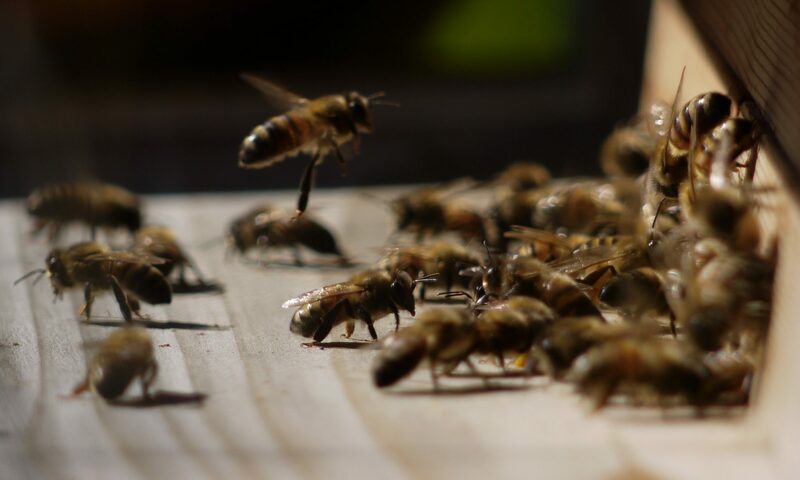 Each of the members listed is covered by Third Party Public Liability Insurance and has several years experience, they may bring a new beekeeper with them who needs to learn good swarm collection techniques. Swarm collection can take a bit of time and they may need to make several visits to ensure that all the bees are collected, Honey bees are wild insects and they may take longer to collect than you had hoped. If the swarm is inside a building structure you will be consulted on what can or can’t be done. We are pleased to offer a beginners course which provides information on how to get started and an insight into the world of the Honeybee. We cover everything from how to build your hive to the importance of gardening for bees and the vital role that pollen and nectar play in their building colony strength. While also covering the importance of disease recognition to handling bees – whether in a National or Top Bar Hive. You will gain from visits to our Training Apiary while also benefiting from visiting members’ garden apiaries and enjoying a support network of beekeepers within your local area. The beginners course runs during April and May and comprises 5 weekly classes at Hopley’s Cafe, Much Hadham plus a weekend visit to the Association Apiary. Contact training@stortfordbees.org.uk for more details or you can register for the course here. We are also a member of Hertfordshire BKA and can participate in their training courses which include New Season Preparation, Swarm Collecting, Basic Assessment Preparation and Microscopy. Please see their website for further details.